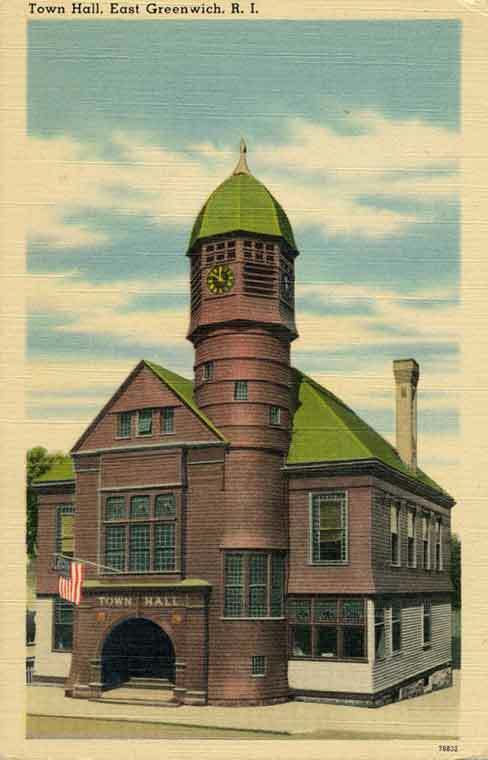 So often in the past few years we have heard someone say - isn't it too bad the Old Town Hall had to be torn down? It was considered one of the finest examples of Queen Anne style architecture in this area. Somehow we never appreciate what we have until it is gone. I think we miss the Town Clock the most. When we were youngsters that old clock saved us a great deal of trouble with our parents. In the summer, while swimming at Nock's Boat Yard and in the winter sliding down King Street Hill we would hear the old clock strike five and we knew it was time to run home. We were not allowed any excuses for being late. Recently, we have discovered a typed copy of the "Specifications of Town Hall for The Town of East Greenwich, R.I." J.B. Goodwin, Architect - September 1885. The first paragraph states "Specifications of materials and labor required in the erection and completion of a Town Hall and Sheds to be built on ground situated on easterly side of Main Street in Town of East Greenwich, Kent County and State of Rhode Island for the Town of East Greenwich according to the drawings made for the same by J.B. Goodwin Architect of 5 Custom House Street, Providence, R.I. and under the supervision and direction of the Building Committee appointed by said Town of East Greenwich or a person or agent appointed by said Building Committee. The usual right is reserved to reject any and all estimates." The Building Committee consisted of: William G. Browning, Wanton Shippee, Thomas Fry, Samuel H. Knowles and Thomas A. Reynolds. Lodowick C. Shippee was the contractor. He was a native of East Greenwich, having been born there in 1847 and died in 1937 at 89 years old. Lodowick was the son of Pardon Vaughn and Hannah Manchester Stone Shippee. Until he was 20 years old he trained to be a farmer. At 20 he began learning the trade of carpentry. Since 1875, he operated as contractor and builder in East Greenwich. He started a company with James Holland and they operated as the firm of Holland & Shippee for several years. Together they built the Henry P. Eldredge house, the Odd Fellow's Hall (located on site of Lindberg's Parking Lot). This Hall burned in the 1940's. They also built the Colonel Bodfish Block which stands on the corner of Main Street and Court House Lane. As L. C. Shippee, contractor, he built The First Baptist Church (Peirce & Montrose Streets), the Town Hall on Main Street and the Fitts & Company, called the Brick Block, on Main Street. According to the 1895 East Greenwich Map, Mr. Shippee's business was located at the foot of Queen Street. Some of the older persons may remember his daughter Grace E. Shippee, who taught many years at the Spring Street School. Lodowick and daughter Grace lived on Division Street in an old house that was formerly the Weaver or White Horse Tavern. For further infor­mation on this family and a picture of the homestead see The East Greenwich Packet for May 1981, vol. 5, #2. According to the East Greenwich Land Evidence Records book 20, page 249, the Building Committee purchased the Stephen Greene Lot for $2,000, from the heirs at law of Sarah P. Greene, late of East Greenwich. Thus, on 15 August 1885, the land had been secured for the Town to build its new Town Hall. The general condition says that the contractor is to furnish all transportation, labor, materials, apparatus, scaffolding and utensils needed for performing the work. All materials must be the best. The carpentry work specifications state that all materials to be of the best description. The works are to be executed in the best, most substantial and thorough workmanlike manner. All molded or cut work is to be made from the solid, all curved or circular work is to be either sprung on or sawed from the solid. No sawing in will be allowed. All moldings etc. must be made in strict accordance with the Detail Drawings. Clear the building and sweep it out and at the completion of the works remove all rubbish and other materials from off the premises, scrub the floors, wash the windows and leave the building fit and ready for occupation. The carpenter to do all necessary wood work cutting etc. for other craftsmen on the buildings, to provide and set centres on which to turn arches in cellar, furnish suitable protection to all openings, to keep out the cold and rain, and hang doors so that the building can be locked up as soon as enclosed by putting in temporary doors and locks. A copy of the complete specifications can now be found in the vault at the Town Clerk's Office at the East Greenwich Town House. In "Our Village Record," East Greenwich, R.I. for Christmas 1890, we find an article entitled "Our Public Buildings" by Vernum J. Briggs. Mr. Briggs states the Town Hall comes next in size and importance to the Court House. It is a handsome two-story building, built of wood, in the Queen Anne style of architecture, standing on the east side of Main Street. The entrance is over granite steps beneath a 10 foot arch. The walls of the interior are covered with hard finish and wainscotting of white ash. On the first floor are the Town Clerk's Office, Council Rooms and Reception Rooms all opening from the hall. The Town Clerk's Office is divided into two rooms in one of which is placed the large, fire-proof vault where the records are kept. At the right of the entrance from the sidewalk is the winding staircase which leads to the spacious public hall on the second floor, where elections and town meetings are held. The building is 46 ft. square and the tower is 70 ft. high. In the tower is the Sherman Memorial Clock, the gift of Mrs. William N.Sherman, formerly of this town. It strikes the hours on a bell weighing 1200 pounds. Mr. Briggs concludes with the Town Hall was built at a cost of $8,000. A more complete story about the Town Clock will be forthcoming at a later date in The East Greenwich Packet. The records of our town, which are in excellent condition, thanks to our conscientious Town Clerks, were originally housed in their homes. In 1871, The East Greenwich Free Library Association built a library on the corner of Peirce & Montrose Streets where the Baptist Church House now stands. In the basement of this building a vault was constructed for the preservation of the Town Records. A meeting room for the Town Council was rented from the Association for $150.00 per year. There our Town Records were housed until 1886 when the new Town Hall on Main Street was finished. The cost to furnish this Town Hall was: chairs and settees; $200, stoves $125, furnishings for Clerk's office, $50, and the shelving in vault, $50. These certainly were the "good ol' days." Mr. Lawrence Bowser in a letter to the Rhode Island Pendulum of 3 December 1964 gives us some interesting facts regarding the Town Hall and the First Baptist Church. He states that these buildings were built at the same time, designed by the same architect, both Queen Anne style and both built by L. C. Shippee. The stained glass in both buildings came from the same firm in London and the granite steps for both structures were dragged here by a three-horse team from an old quarry at Hope, R.I. In addition to the Town Hall itself, sheds were constructed in the rear of the building. The sides of the sheci.s were to be covered with 7 /8 inch pine stock matched boards. The-roof was to be covered with 7/8 inch hemlock and shingled with good cedar shingles. One interesting fact told by Paul Spencer notes that across the east end of the property on which the Town Hall stood was a row of stalls built for horse and wagons. The home of Jasper Spencer was on Marlborough Street behind these stalls. Mr. Spencer said that his father, Jasper Spencer, obtained permission from the Town to cut a door in the back wall of one of the stalls so his mother could walk through and do her errands on Main Street rather than go around the block and climb the King Street hill. In 1964 the Hi-Lo Construction Company of Johnston, R.I. was awarded the contract to raze the old Town Hall with a bid of $4,500. Thus the fine old lady was demolished much to the regret of many old timers. Our Village Record, Christmas 1890, East Greenwich, R.I.